Abstract: An association of eight taxons of marine algae is described from the anchimetamorphosed dolomites of Late Visean - Namurian A age. The algae confirm this determination of age based previously on conodonts. The flora is indicative of latest Visean Zone l6 to Early Serpukhovian Zone 17. The microfossils from the locality Furmanec are somewhat older, indicative of Late Visean (Zone l5 to 16?). Abstract: Two new ostracod species, belonging to the loxoconchid genus Nipponocythere Ishizaki, 1971, i.e. N. karsyensis sp. nov. and N. silesiensis sp. nov., are described from the Middle Miocene (Badenian) of the Fore-Carpathian Depression, Central Paratethys. We consider them "exotic" forms, that is rare and previously unknown from the Badenian of the Paratethys. 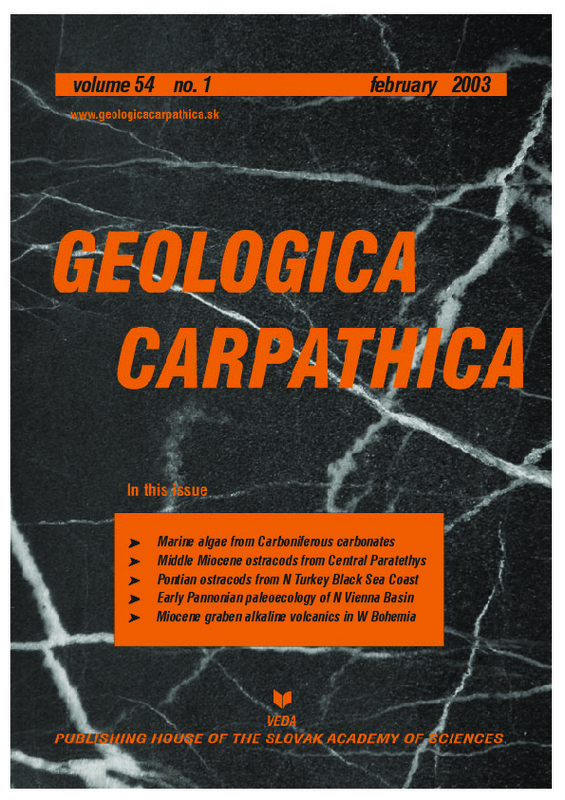 Their occurrence in the Middle Miocene of the Polish part of the Central Paratethys is thought to prove oceanic water influence into the northernmost parts of the Fore-Carpathian Depression (basins). The unusual morphometric features of these Nipponocythere species and of their associated "exotic" ostracods, in the Upper Badenian of the Upper Silesia, is presumed to be due to a paleoenvironment rich in food and undersaturated in CaCO3 and/or O2. Abstract: In this study, 33 species (ten subgenera and one indet. subgenus) of Candonidae have been taxonomically determined from the eastern Black Sea region of Turkey. These are Candona, Caspiolla, Caspiocypris, Pontoniella, Bakunella, Lineocypris, Reticulocandona, Typhlocypris, Metacandona and indet subgenus. Five species are described as new namely: Candona (Caspiolla) ataensis, Candona (Pontoniella) turcica, Candona (Lineocypris) bafraensis, Candona (Caspiocypris) trabzonensis, Candona (Reticulocandona) stanchevae. Candona and its subgenera are dominant fossils in the sedimentary record of the Eastern Black Sea during the Pontian. These localities could be described as the "Candona Sea" due to this fact. The “Candona Sea” extended along the North Anatolian coast from the Sinop Peninsula to the Trabzon (Arakli) area during the whole Pontian and contains few endemic species. On the basis on the environmental properties of Candona and the other identified Ostracoda species, this aquatic environment could have had oligohaline (0.5–5 ‰) and mesohaline (5–18 ‰) salinity conditions in Pontian. This “Candona Sea” was located on the southern border of Paratethys bioprovince and it has connections directly with Pontian, Euxinian and Caspian Basin bioprovinces during this time interval. Abstract: The studied sections are situated on the northwestern margin of the Vienna Basin. They represent a characteristic marginal facies of Lake Pannon in the late Miocene Pannonian stage. Biofacies as well as lithofacies point to a transgressive event resulting in the shift from deltaic, riverine conditions to the formation of freshwater marshes and lakes and, finally, in the deposition of offshore clays. Biostratigraphically, the logged sequences correspond to the regional Pannonian mollusc ”zone” C. The extraordinarily fine-scaled Paleoecological resolution might serve as a basis for a correlation of 4th order changes reported from basinal settings of the northern Vienna Basin. Thus the rapid facies succession on the northwestern margin of the Vienna Basin is interpreted as being linked to major lake level changes rather than to solely local changes in the riverine system. Abstract: The Middle to Late Miocene intraplate alkaline volcanism of W Bohemia is associated with the uplift of the NE flank of the Cheb-Domazlice Graben. Two coexisting cogenetic volcanic series have been recognised there: (i) weakly alkaline series (WAS) basanite – trachybasalt – (basaltic) trachyandesite – trachyte – rhyolite (15.9-11.4 Ma) and (ii) strongly alkaline series (SAS) olivine nephelinite – tephrite (16.5-8.3 Ma). Similar patterns in olivine nephelinite and basanite PM-normalised incompatible trace elements point to a single mantle source that was geochemically similar to EM. Negative Rb and K anomalies probably reflect residual amphibole in the source. Magma modelling showed that olivine nephelinite and basanite could form by different degrees of partial melting of the mantle source, with amphibole, garnet, olivine and clinopyroxene in the residuum. The mantle source was probably represented by lithospheric mantle metasomatised by plume-like material. Evolution of the SAS is limited in extent and rather unclear. The WAS is well developed and its evolution can be modelled by fractionation of olivine, clinopyroxene, Fe-Ti oxide, and a small proportion of plagioclase, and in late stages by alkali feldspar, Fe-Ti oxide, clinopyroxene and apatite. Crustal contamination cannot be ruled out but there is no substantial evidence of this in felsic derivatives.